I have found that most of the time, things don’t go the way you think they will. So when I earned my masters in drawing/printmaking from the University of Iowa, I was ready to begin creating full time and selling my work! Of course life intervenes and, shortly after graduating, my husband and I were privileged to have three sons, each 2-3 years apart. journaling can weave creativity into daily life. 1. 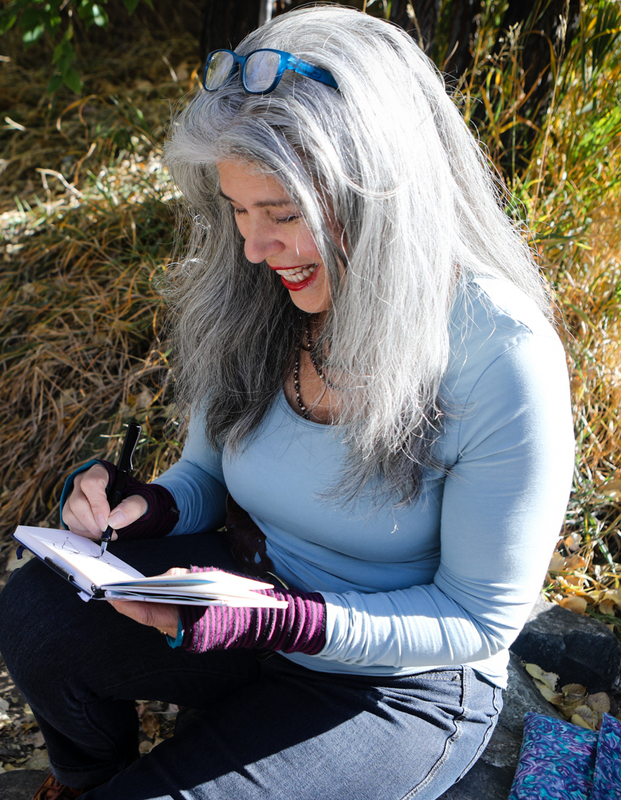 Reflecting on these journals has been an unexpected gift, revealing my life from a intimate perspective, giving me an opportunity for reflection. This gives a bird’s eye view of the current map of my life. 2. Memories come welling up in my heart, as I page through, nudging the past back into consciousness. 3. Details that I had forgotten are right there in my drawings and writing. 4. Drawings and poems about events and thoughts, that were forgotten in the midst of everyday activities are reclaimed. 5. There is affirmation of the joy and recognition of the sorrows of my life. 6. I have an Opportunity to make a future based on recovering where I have been. 7. Material is at my fingertips, for both writing and painting with historical and creative primary source materials: my own journals. Now when I am working, and I want some inspiration, I include my personal journals among the literary and artistic inspirations available to me. This is how I did it. I made a minimal packet in a small zip lock bag with a refillable ink pen, a pencil, eraser and sharpener, a plastic water-brush and a Moleskine journal, with sturdy paper that could take take light watercolor washes. As my bag and time allowed I added watercolor crayons, regular crayons, oil pastels and a portable box of watercolors. For a long vacation when I knew there would be a lot of relaxed time, I added larger paper and brushes, along with a lightweight coated masonite board on which to fasten precut/ torn paper. What do I do with journals when they are filled? As each journal neared the end, I placed on a shelf, High up in my studio area. Last year when we were renovating our home, I Had to clear off my journal shelf of what i surmised, was 10 journals. Surprise, I had 130 journals. I had never counted them and barely had the time to review them through the years. Like a garden, I have reaped a harvest that is constantly providing nourishment that is based on my life and the memories and images I have collected. But it’s not the only way…. My gift to you is the story of how it happened. I would love to hear you own way of reflection on your life that has helped you to grow creatively, in whatever medium you work! Is your art, raising children, making healthy desserts, finding balance, managing money, training animals, making music, doing massage, teaching yoga, being a lawyer, keeping a beautiful home? I am very excited to hear your story! finding refuge #0925 watercolor © beth vendryes williams 1500.
begins with wondering about how to deal with my heart, my art and what is happening around me. The daily patterns of life that I inevitably engage in a call to me for exploration. I find they provide moments rich for reflection. The hours of the day progressively transform my bedroom, and the effect of light and shadow change me, too. Holding a cup of steaming café or tea stirs the senses with warmth, aroma and sharing thoughts. Taking a walk can allow me space to carefully observe in an open, non-dualistic way. Simple objects contain the history of the souls who touched, created and used them; the insistent patter of raindrops creates a cadence, inviting a meditative state. These are just some of the experiences I plumb to investigate the unopened treasures that we have strewn before us, every day! I am strongly affected by the plight of the refugees in the world right now. My heart goes out to the souls who risk their lives as they leave a place that is unsafe for them. I wonder, can we even truly understand the depth of their fear, the sorrow of leaving a home, the pain of being hungry, the danger of running away? If they are lucky enough to make it out, many are turned away by a country or segmented in tents living in temporary camps for years! Can I ever understand? It certainly is easier to say they were “turned away by a country” rather than" I turned them away." Maybe, I could help by holding them in my heart and thoughts as I learn more about what it means to be in need of refuge. I do need to make art. Is that where I seek refuge? Is that also where I can offer a place of refuge? I do need to make art. Is that where I seek refuge? It appears so because I am compelled to return to my practice day after day. There is a source inside me where I go to create imagery that resonates with my soul. Now, I imagine the experience of finding “refuge” in my life. What would I do if I couldn’t create time and space to paint and draw? For me, creating is a “basic” need. Without the opportunity to paint, I would feel bereft. I need a place to shout with joy, to feel empathy with others and express it, admire beauty, recognize pain and sorrow, search for evidence of meaning in this life, far beyond manmade laws. I cannot hide this or pretend it is not there. It is my work, and I need to share it. My art is saying “Look here, what you thought was nothing important, like sleeping, opens up worlds to you!". Deprived of sleep, you cannot concentrate. Taking time to assimilate your day and to allow your spiritual and physical body to rest, is essential for your sanity. The idea of restoring yourself, letting go, being quiet, recording dreams, creating patterns to invite sleep, deepens you to nurture a contemplative life. My practice involves observing such a simple habitual act, as if for the first time! I paint to discover, then honor, the dignity in an ordinary moment. My dear readers, has something ordinary ever suddenly taken on a surprising beauty that you never noticed before? I look forward to your thoughts!